The Halloween pumpkin that I decorated with a stick-on mustache, google eyes, and a crooked drawn-on smile yielded lots of pumpkin purée. This pumpkin purée came in handy this weekend as I baked and prepared for a houseful of guests which will start descending in waves on our abode starting Tuesday. In a medium mixing bowl, add flour, baking soda, salt and spice. Whisk together to incorporate. Set aside. In a bowl of a stand mixer or large bowl, whisk the oil, maple syrup and eggs. Mix in the pumpkin purée, milk, and vanilla. Remove bowl and stir in dry ingredients and pepitas. Mix with a wooden spoon until just incorporated. Do not overmix. Scoop batter into prepared muffin tins. 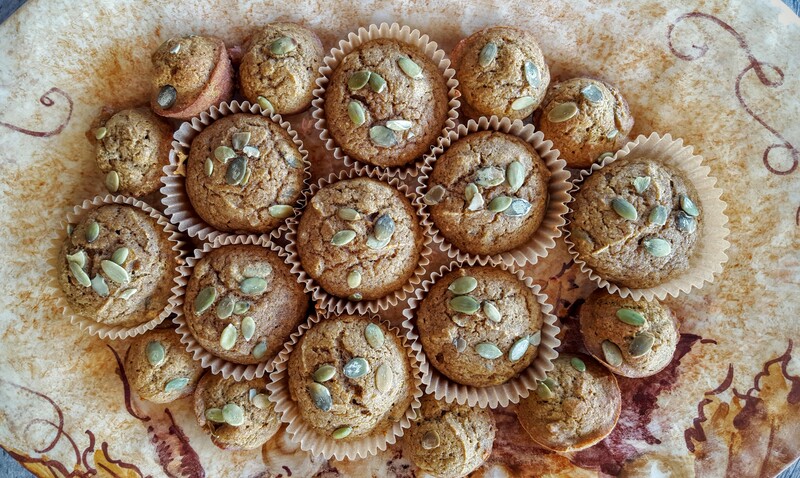 Divide the remaining tablespoon of pepitas and sprinkle on top of each muffin. Bake muffins for 20 to 25 minutes, or until a toothpick inserted comes out clean. Cool pans on racks. Wait until cool to serve. Now, for the promised bonus recipe: Chai Spice. Combine spices. Store in an air-tight container. Use instead of pumpkin pie spice in recipes. 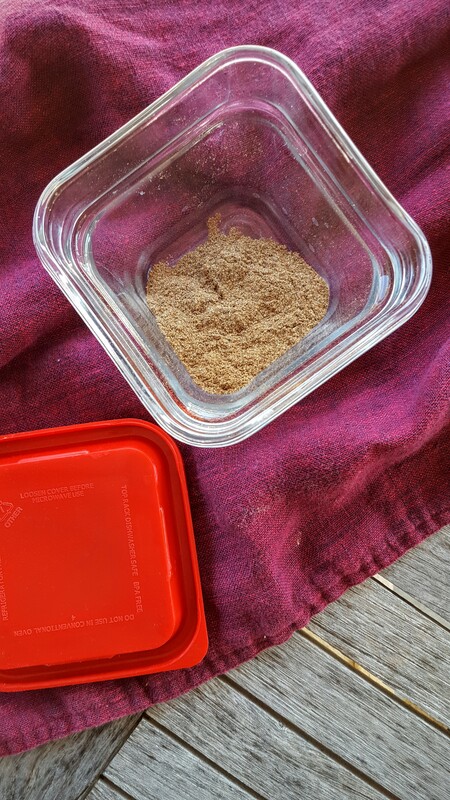 Use instead of apple pie spice in recipes. Add to waffles, pancakes, or muffins that call for cinnamon for a spicy breakfast. Add a bit to hot apple cider. Chai Spice: This smells divine. You may substitute 1 cup white flour + ¾ cup whole wheat flour. If you do not want to make homemade chai spice, you can substitute pumpkin pie spice. If you prefer, you may substitute old-fashioned rolled oats, pecans, walnuts or even white chocolate chips for the pepitas. Although these are “healthified” with whole-wheat flour, coconut oil and 2% milk, The Hubs offered the following advice: “These could use a sweet drizzle on top.” I do imagine they would be a bit more attractive with a drizzle of white chocolate, cream cheese frosting or even a simple stream of powdered sugar/milk glaze. I, however, think these are just sweet enough. Enjoy your baking, menu development, grocery shopping, and house cleaning if you are hosting this year’s Thanksgiving shindig. What a delicious mouthful!!! 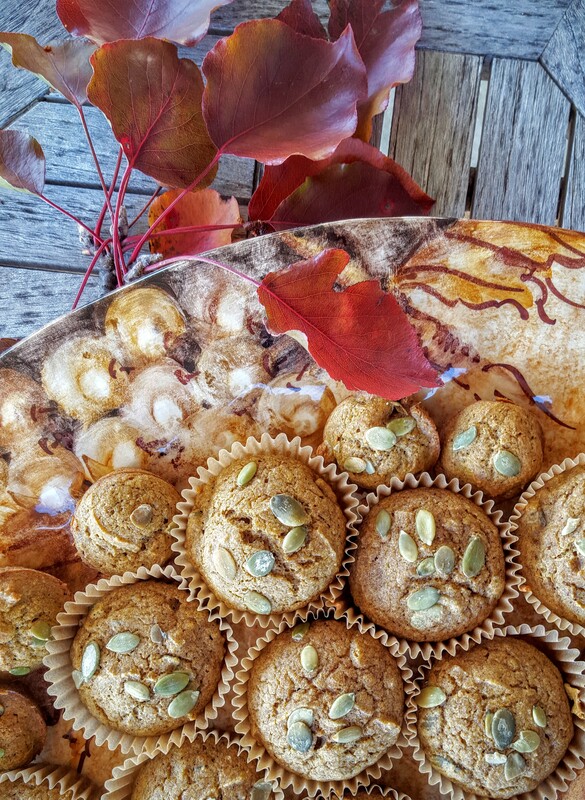 Chai, coconut, maple, pumpkin – these are awesome holiday muffins! I will definitely make these again. I love using the pepitas (instead of oatmeal). mmmm…chai and maple…those muffins must have tasted heavenly! Great combination, right? I’m glad it worked out. YUM! I love anything maple and with pumpkin seeds? Oh yes! Thank you, Kelli. These are great with hot tea or coffee in the morning. I just sent The Hubs off to work with a bagful for his co-workers. Luckily, I am on break ALL this week! Have a great Thanksgiving! You too! I just made some muffins yesterday and my daughter took most of them off to work with her this morning too! I’m not a big tea person so that whole chai tea thing went right past me but I do love the chai spice so thank you for providing a good recipe for it. And those muffins … oh my, my, they look delicious.